FILE - Afghan President Ashraf Ghani participates in "The New Beginning in Afghanistan: A Conversation with H.E. Dr. Mohammad Ashraf Ghani, President of the Islamic Republic of Afghanistan" at Columbia University in New York on March 26, 2015. An insurgent group fighting alongside Afghanistan’s Taliban has said it is ready to join political reconciliation talks with the Kabul government, despite being deeply skeptical about peace intentions of the other side. Afghan President Ashraf Ghani last week renewed his offer of negotiations to all insurgent groups in his bid to seek an end to the devastating war, now in its 15th year. The United States, China and neighboring Pakistan have all welcomed and backed Ghani’s move, though the mainstream Taliban faction has rejected the offer. But in a statement released to media on Sunday, the Hezb-e-Islami (HIG) faction led by fugitive Afghan warlord Gulbuddin Hekmatyar, said it has accepted the government’s offer and is “prepared to participate in the talks to show to the [Afghan] nation it wants peace." FILE - This image made from video released to the Associated Press during the week of Nov. 21, 2015 shows Afghan warlord Gulbuddin Hekmatyar, now in his late 60s, in an undisclosed location. An Afghan national unity government spokesman, Javed Faisal, welcomed the announcement. "It is an important and good news because Hezb-e-Islami has for years been fighting the Afghan government," Faisal told VOA. He urged other armed opposition groups to join the talks to help end the war. A senior HIG official also told VOA on condition of anonymity that a two-member team has also been formed for the negotiations. It includes the group’s central council chief, Qazi Hakim Hakim, and head of its political affairs, Ghairat Baheer, a son-in-law of Hekmatyar. The insurgent group has accused the United States of trying to sabotage Afghan peace efforts. It cited last week’s U.S. State Department announcement in which two senior HIG members were designated as global terrorists for their roles in deadly attacks in Kabul, including a bomb blast that killed six Americans. The Obama administration has identified the two men, Abdullah Nowbahar and Abdul Saboor, as explosive experts for the militant Hezb-e-Islami. FILE - In this Aug. 27, 2013 photo, Afghan National Army soldiers stand guard on the outskirts of in Kabul, Afghanistan. It also offered rewards of up to $2 million for Nowbahar and up to $3 million for Saboor for information leading to their whereabouts. The designation of two Hezb-e-Islami members as terrorists and offering millions of dollars reward for their arrest at a time when President Ghani has invited the group for peace talks show that Washington is not willing to end its war in Afghanistan, the Afghan insurgent group alleged in Sunday's statement. 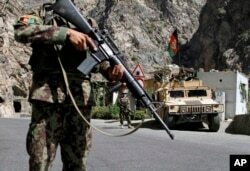 It also blamed certain elements within the Afghan government for opposing peace efforts, but did not elaborate.